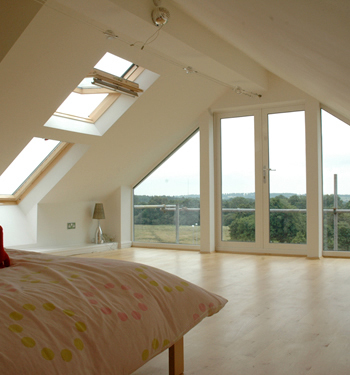 Loft conversions are an ideal way to create additional living space without having to move properties. 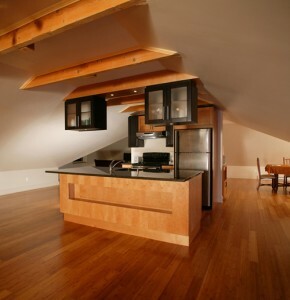 An empty attic can be transformed into a beautiful living room, extra bedroom, office or place for entertaining. Once you have adjudicated that the dimensions of your attic meet building control regulations, you can begin designing for your accommodation needs. 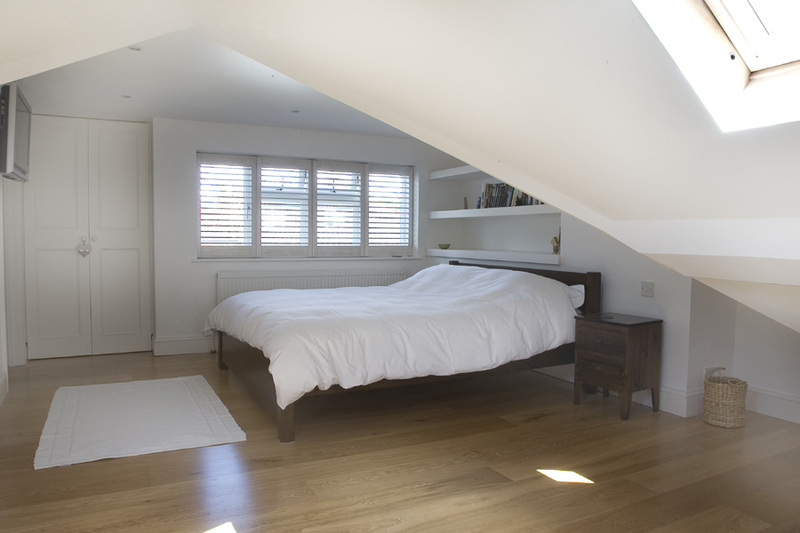 The above is an example of a loft conversion into a no-frills spare bedroom. The white walls and linens combined with wooden floors and furniture create a neutral space. Choosing a streamlined interior design instantly makes converting your attic more affordable while maintaining a clean aesthetic. This luxurious loft conversion feels extremely spacious by virtue of the ceiling-to-floor windows and french doors. Large amounts of light flood in and reflect against light wooden floors, giving the room an airy quality. Installing windows is the most effective way to incorporate the natural world into your home, and because many loft spaces are small, large windows and glass doors immediately expand the room. 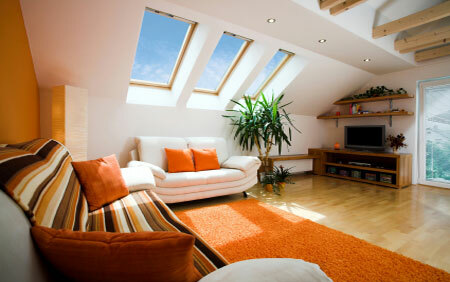 The bright orange color scheme and large skylights make the above loft conversion feel vibrant and inviting. A plush area rug, numerous pillows and a large plant give the spacious room a cozier feel. The loft almost has a “retreat” feel, where you could comfortably gather with friends for a movie, or simply to curl up and a take a nap. 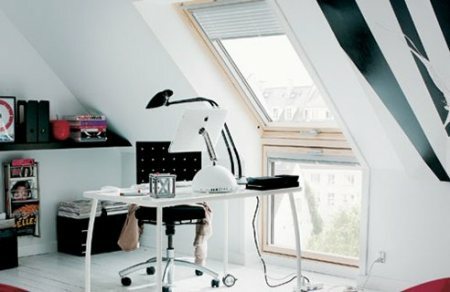 Reclaiming your attic as an office is another useful loft conversion idea, and can give working from home a whole new appeal. The attic is isolated enough from distraction to allow you to focus on the tasks at hand, while still providing the comfort of being in your own home. 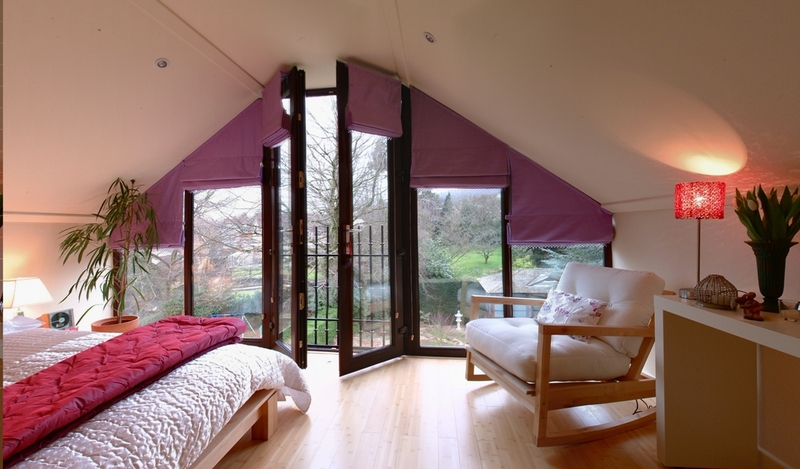 In the above office loft conversions, the use of skylights and light interior color brighten the room. Converting your loft into a kitchen/dining room is a more involved project than the more common bedroom/living room option. However, if all building code regulations are met, it is a delightful idea for creating an alternative entertaining area. Often a large percentage of a property’s potential space is in the attic, and converting it into a wide variety of usable living quarters can add significant value to your home.